Ecce nova facio omnia: Happy Solemnity of St. John the Baptist! Happy Solemnity of St. John the Baptist! Yes, I tell you, and more than a prophet. This is the one about whom it is written: 'Behold, I am sending my messenger ahead of you; he will prepare your way before you.' Amen, I say to you, among those born of women there has been none greater than John the Baptist; yet the least in the kingdom of heaven is greater than he. Matthew 11:9-11. When Elizabeth heard Mary's greeting, the infant leaped in her womb, and Elizabeth, filled with the holy Spirit, cried out in a loud voice and said, 'Most blessed are you among women, and blessed is the fruit of your womb. And how does this happen to me, that the mother of my Lord should come to me? For at the moment the sound of your greeting reached my ears, the infant in my womb leaped for joy. Blessed are you who believed that what was spoken to you by the Lord would be fulfilled.' Luke 1:41-45. The reason this makes me smile has to do with John leaping for joy at the presence of his Lord, and this passage will forever be linked in my mind with the first time Rosie and I saw our son (though we didn't know he was a he at that time!) using ultrasound. We went straight from Mass to the doctor's office. During the appointment, the technicians could barely get him to stay stationary for long enough to take the necessary measurements. The first thing that popped into my head was this passage, and I knew that he wouldn't stay still because he had just received the Real Presence of Christ in the Eucharist. This solemnity also gives me to share one of my favorite paintings, Raphael's Alba Madonna, which I included at the top of this post. Unlike some other paintings from this period which feature the same three figures, the hierarchy in this painting is different. In others, John is portrayed as looking at Jesus, who in turn is looking at his Blessed Mother. 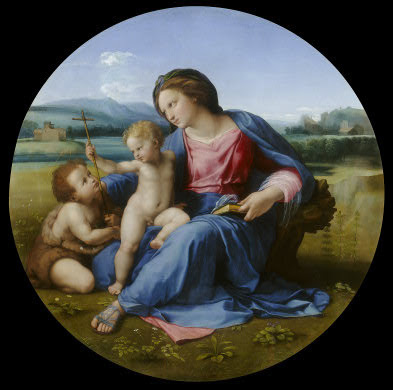 However, Raphael portrays them as all focusing on one thing: the cross. Which, y'know, happens to be kind of important for our salvation. Anyway, this painting is by far my favorite work in the National Gallery of Art, and I've been known on more than one occasion to go to the museum just to see it.